Selling for $6.99 0 1 Like this product? A roses wrapped in a nice decorative sleeve for giving as a gift. Love is in the air with Valentine's Day Decorations! 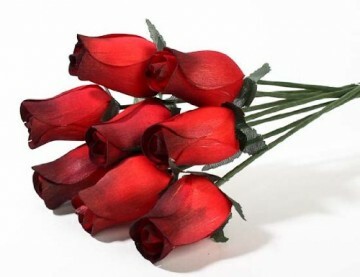 Red Roses in Cellophane Sleeve is the perfect way to decorate for your Valentine's Day party. Make your Valentine's Day party stand out from all the rest with the perfect Valentine's Day decorations. Realistic Bouquet of 8 Wire Stem Wood Roses in Cellophane Sleeve - So realistic its is hard to Believe they are made from thin shaved wood! Inspired by Nature is an independent florist specializing in alternate wedding florals for creative brides. We love what we do and are passionate about bringing the very best of quality and finest flowers to you. We are based in Wausau and provide service to all of Wisconsin. Our focus is to create unique and artistic floral designs using fresh flowers and permanent botanicals while emphasizing natural environmental practices.